I went to Nottingham a little while ago for a gaming weekend. 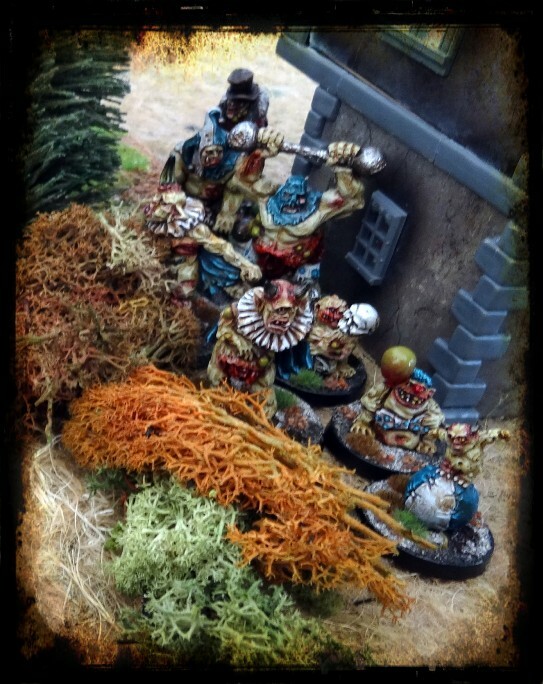 One of the highlights was the opportunity to play some Mordheim with my Carnival of Chaos/Circus of Corruption. 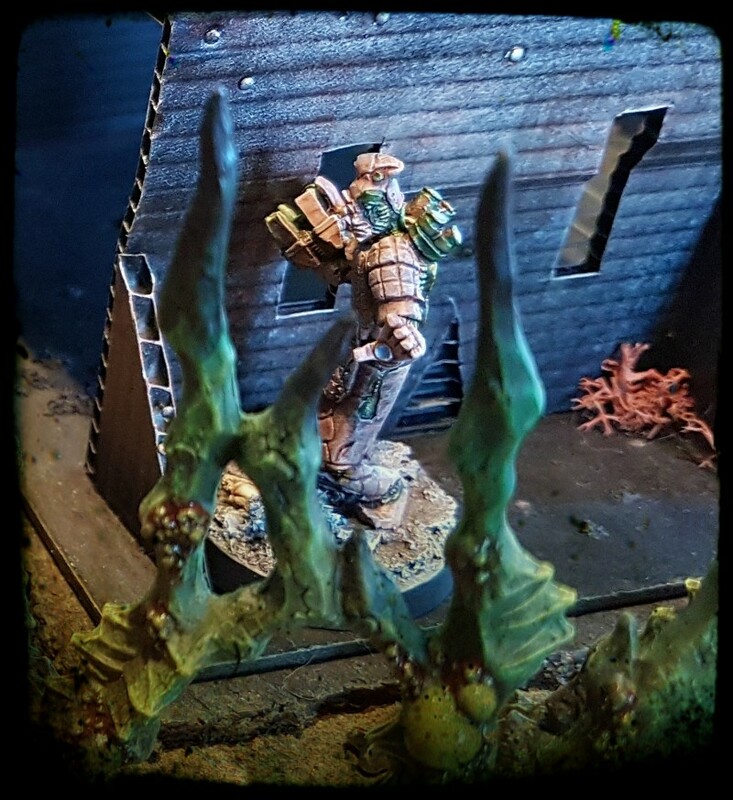 If you can endure the pretty dodgy photography, then you can see a number of weird miniatures looking for treasure and beating up vampires with gym equipment. 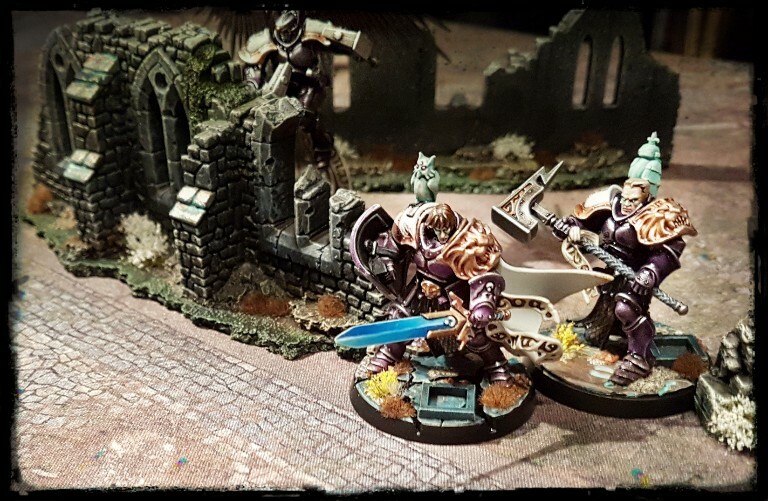 theottovonbismark’s Crossroads Slaaneshi Cultists welcome safe drivers. I have been gearing up to some Dracula’s America (in Spaaace) gaming for several months. 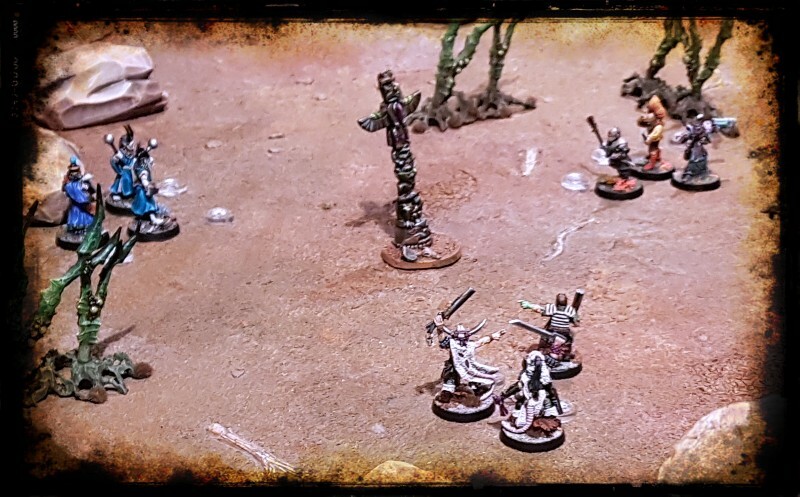 theottovonbismark and Mr Saturday were caught up in the perilium rush enthusiasm and headed to Standard Falls (via Uncanny Valley) recently and we played some games. 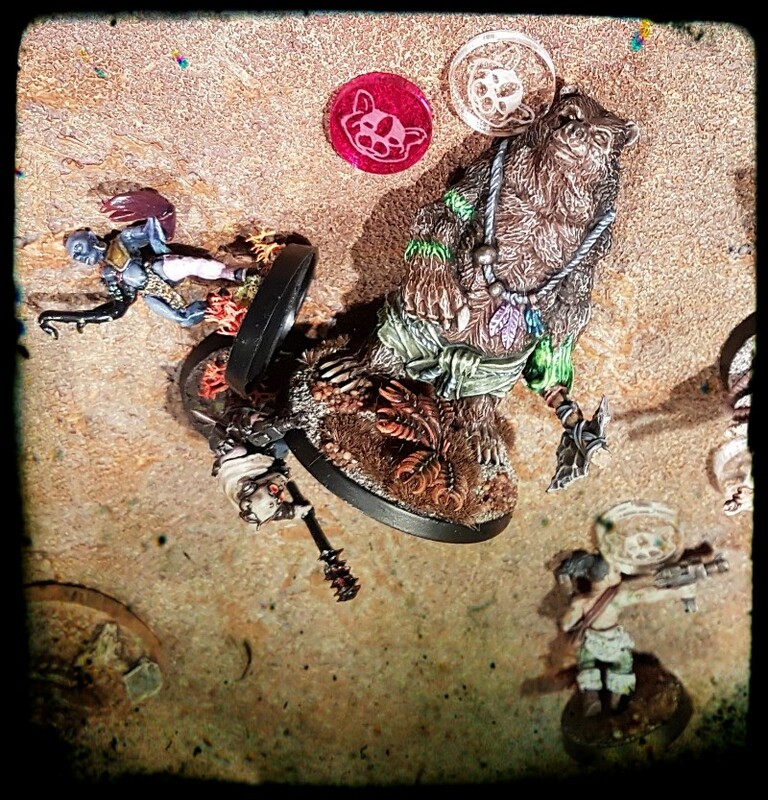 The Boss Drum Ratskin tribe, the Crossroads Cult of Slaanesh and the Shadow Empire Tong cautiously attempt to parlay in the Uncanny Valley deadlands. I was lax about taking photos this time around, but Mr Saturday grabbed a number of nice ones that can be seen over at his blog. 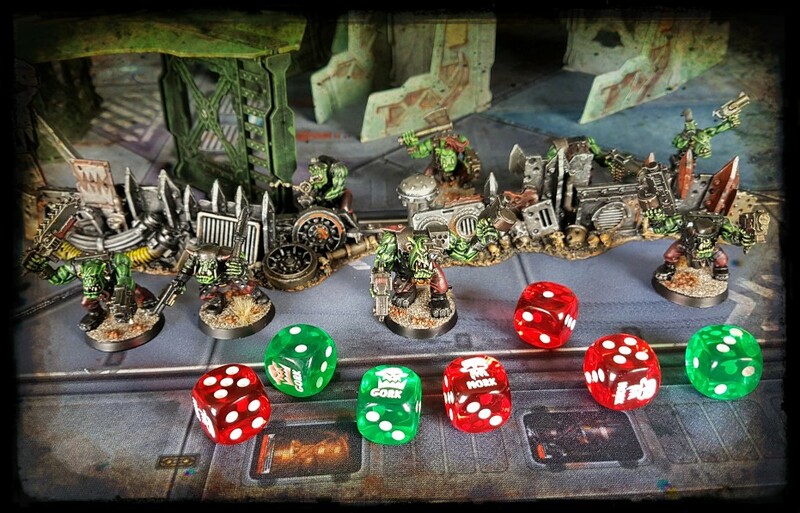 It’s also a good place to see some nice photos of the lovely new additions to his Shadow Empire force. 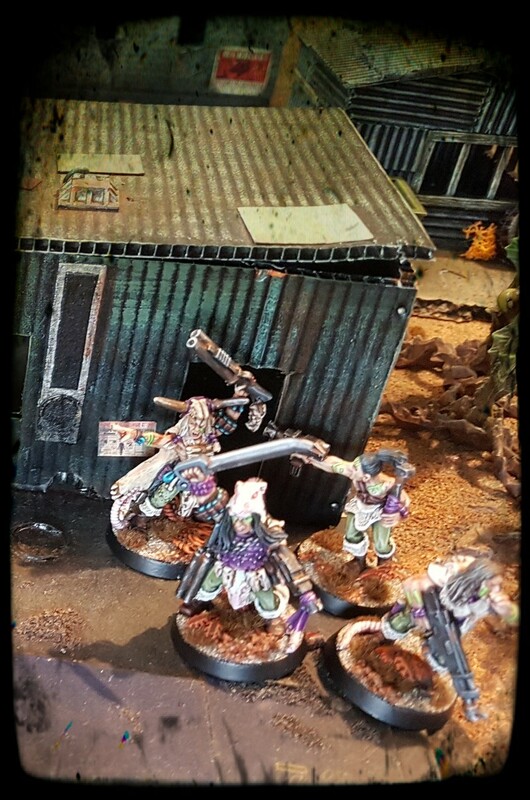 There are some nice photos of theottovonbismark’s Slaaneshi cult over there too. 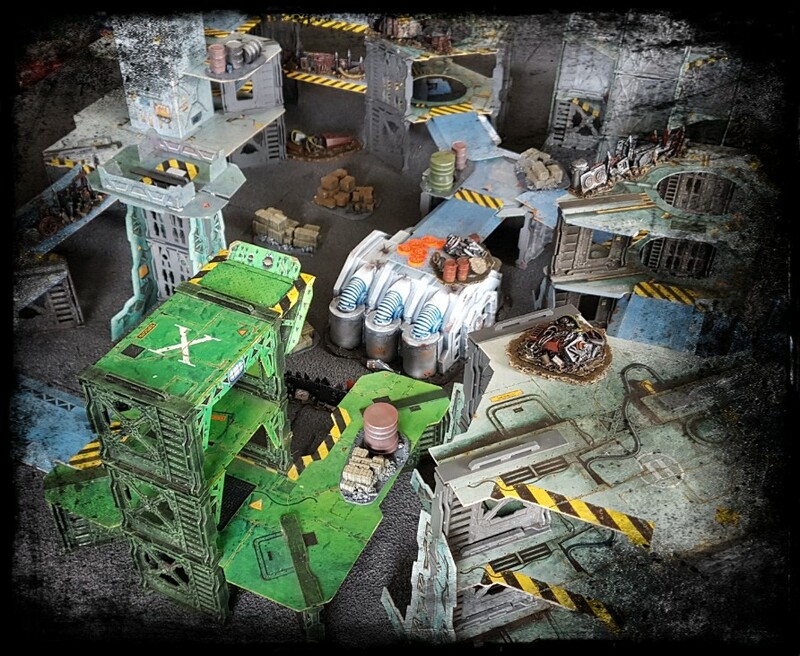 A three metre tall robot covered in missile launchers and crockery “sneaks” around the scruffy boomtown of Standard Falls. Although described by some as a “sad” photo of a lying down space bear-man, I choose to see it as the external view of an enlightening vision quest for a lying down space bear-man… lying next to a pervert demon. Ebeneezer Basshunter, Soundbyte, Mr. C, and Talks Big critique the sub standard guttering prevalent in this part of town. This photo does not capture the obscene levels of luck attached to the pot-bots at this point. Meanwhile Lo Pan assists a local possessed by Vinz Clortho on his way to meet the Gatekeeper. 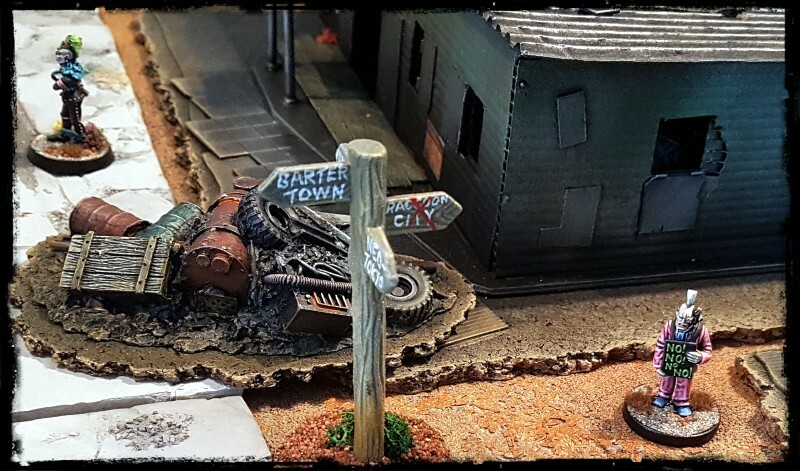 As the dust settled, the eclectic citizens of the remote, but newly resource rich mining town got back to regular business. 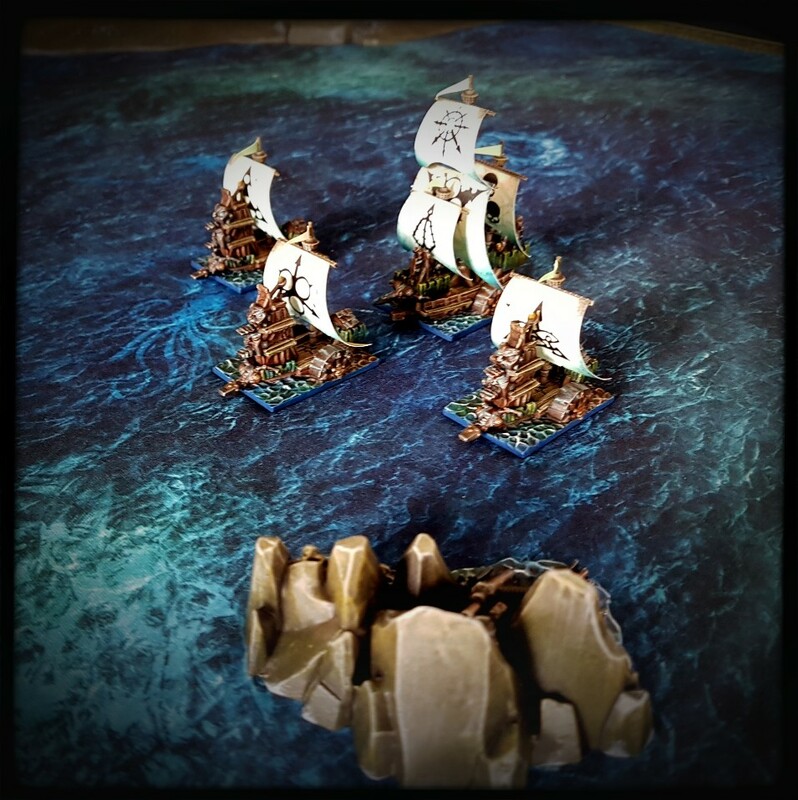 PB visited for the weekend and we got five AoSS games played with our new Nighthaunt and Stormcast forces. Very satisfying. We had a load of fun. 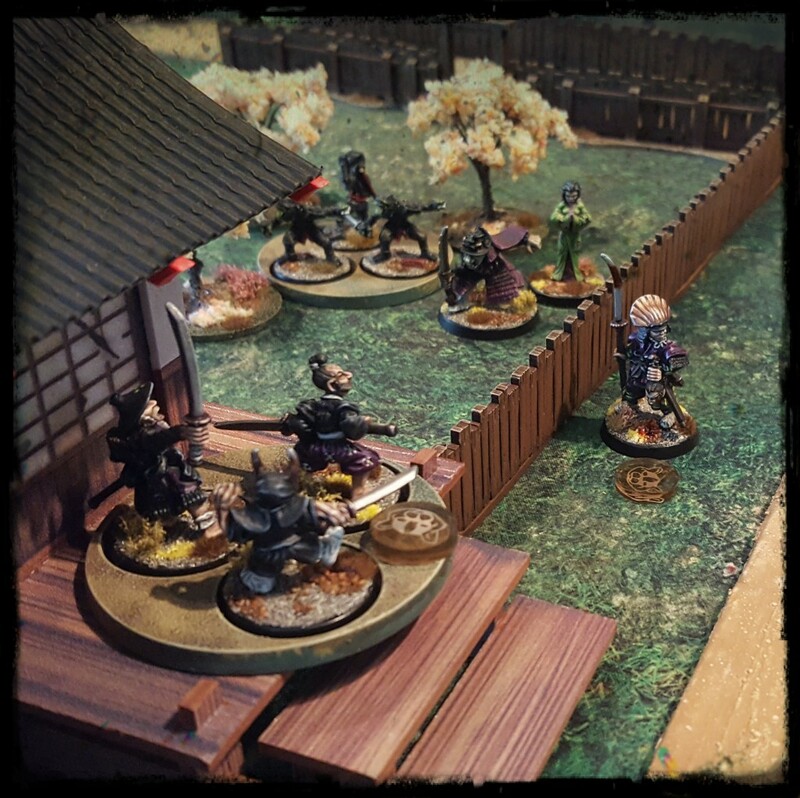 PB and I got together for a weekend of testing each others honour with 28mm feudal Japanese miniatures. Ancestry was besmirched, heads were divorced from bodies and many, many vocal impersonations of the sound of arterial spray filled the gaming dojo. Samples of appropriate arterial spray sounds impersonated can be found in the clip of research material above. My buddy PB visited recently and we decided to get our pulp sci-fi on. 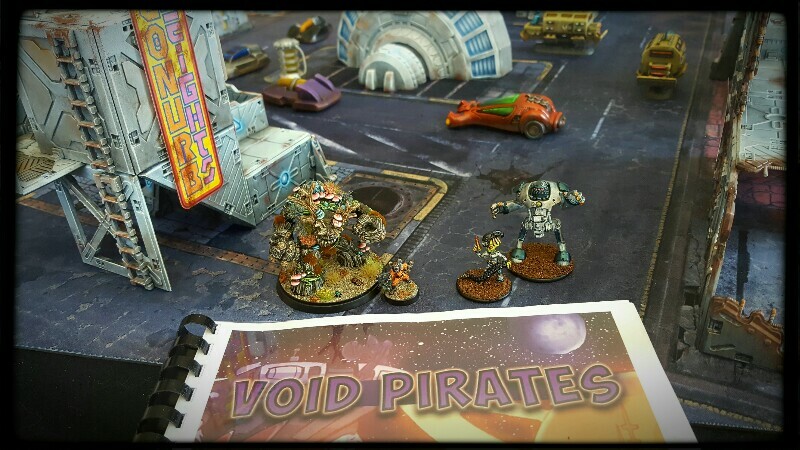 We each rapidly chose two of the seven premade bounty hunters from the “Void Pirates” book and selected a scenario from the companion “Blasters and Bulkheads” book, leapt into our futuristic silver jumpsuits and got stuck in.